They often say to write what you know, but it’s often hard to put unfamiliar things into comics. While most comic readers are familiar with masked vigilantes from years of superhero comics, it’s not many fans that are familiar with the world of animal rights activism. Still, Matt Miner wrote what he knew when he started Liberator. Trading in the capes for ski masks and sledgehammers, Matt launched Liberator at Black Mask Studios. It mixed animal rights, vigilantes, and the comic format to make something that surprised a lot of readers and gained an audience. After a successful second volume of Liberator Miner has now teamed with Jonathan Brandon Sawyer to take central characters from the two volumes of Liberator and take them in a new direction with Critical Hit. Miner and Sawyer take two of the main characters from Liberator, Jeanette and Sarah, and take them in a brand-new direction. While the story starts off with the characters engaging in illegal and destructive vigilante activism, it soon takes a look at the pasts of both characters before putting them into a whole new situation. 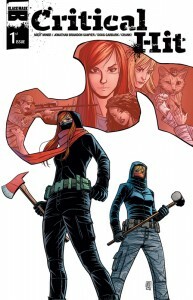 Before the issue is over, the girls are thrust into a whole new world of horror as they become the targets of a group who are tired of just hunting animals. The book starts off with lots of action as Miner has the girls take out a hunting lodge. The overlay of personal thoughts from the characters as Sawyer brings to life the crazy action and destruction of the night is fantastic. It’s the slower, quieter moments though where the creative team arguably shines. Miner has time to build up more of the story and personality of his characters while Sawyer lushly brings it all to life, giving great detail to even small facial expressions. With a new course for the story, it only makes sense that Miner would want a new artist to work with and he’s done quite well with teaming up with Sawyer. He’s going to be doing something big in the future. All in all, Critical Hit continues in the footsteps of Liberator by being a singular sort of story that never ceases to surprise. While it may not be for everyone, it at least deserves a chance because it’s guaranteed to be a little different than you expected. Miner and Sawyer are working really well together in this first issue and it’ll be great to see what the duo does as Critical Hit continues to tell its story.